Vumbura Plains Camp and Little Vumbura are situated in a private concession in the extreme north of the Okavango Delta. The concession, which is leased from the neighbouring community, includes a wide variety of habitats, diverse wildlife and an enormous traversing area of 60 000 hectares (130 000 acres). Little Vumbura is situated on a small, secluded ialsnd in the same region Vumbura Plains. What makes the Vumbura concession so unique is its position on the extreme north of the Okavango. This position encompasses such a wide variety of habitats and species, that it has representatives of just about every animal that occurs in the Okavango biome. Vumbura Plains camp comprises two separate seven-roomed satellite camps, each with its own raised dining, lounge and bar area tucked beneath a canopy of cool, shady, indigenous trees and with a magnificent vista across the floodplains. A star-gazing deck with comfortable cushions protrudes into the floodplain, a place to gaze upwards, or a convivial camp fire setting. If you're expecting a classic safari-style camp, Vumbura Plains breaks all those expectations. Each large, luxurious room is raised off the ground on wooden decks and each comprises a bedroom, lounge, shower and bathroom - with indoor and outdoor shower of course. It is open on three sides, and the billowing curtains between the various areas create the sense of a yacht floating through the floodplains. Each room also has a plunge pool and 'sala' - a comfortable area to lie and relax, watching the waving grasses of the floodplain. Little Vumbura camp is a beautiful six-roomed tented camp shaded by the canopy of an ancient Okavango forest. Each tent is large and roomy and has en-suite facilities. A plunge pool and reading area overlook the floodplains and a star deck leads off the dining area. Surrounded as it is by water and lying close to large rivers, water-based activities are a focus, with mokoros traversing the floodplains under the guidance of experienced polers and motor boats on the permanent channels. Vumbura Plains & Little Vumbura offer both water and land activities as this area has scenic waterways and is also close to the Okavango's outermost open savannahs. The water levels around the camps change each year depending on the level of the annual floods from central Africa. The privacy of this area is one of Vumbura's main attractions - along with its great wildlife and superb all round Okavango experience. The main activity at both camps is game viewing in wonderful and varied countryside. Open 4x4 Land Rovers allow close proximity to animals in the savannah and forested areas. The Vumbura area is possibly the only area in the Okavango where one can see Red Lechwe (an animal that inhabits the fringes of the waterways) and a Sable antelope (an animal that enjoys the dry countryside) on the same game drive. Add in Lion, Leopard, Elephant, Cheetah and Buffalo along with all the plains animals and one has an excellent all-round wildlife experience in a remote and private part of the Okavango. Birding too is great with large varieties and quantities. Walks, mekoro’s and boating give Vumbura's guests the opportunity to enjoy Africa from a different perspective. Night drives are possible nearly all year, but may be restricted for a few months in the middle of each year if there are extremely high flood levels. Walking safaris are a must for anyone who has only experienced Africa from a vehicle - getting close to nature with a knowledgeable guide should not be missed. The mekoro safaris here are also excellent as well as motor boating through the Delta's lagoons and channels. For those who enjoy fishing, Vumbura is one of the Delta's best areas to catch Tiger Fish, Bream and Tilapia. Vumbura Plains and Little Vumbura are situated in the extreme north of the Okavango, in what is known locally as the Kwedi Reserve. The vegetation ranges from the vast open flood plains to dense mopane bushveld which offers spectacular game viewing and birding opportunities all year round. The permanent swamp and island habitat abounds with beautiful treed islands of every size, surrounded by permanent waterways, which are created either by the summer rains or the annual floodwaters that pass through the Delta in the winter season. Common trees found here are the jackalberry, African mangosteen and the ubiquitous sausage tree, which provide shade, food and shelter for a fantastic range of wildlife. Here it is possible to encounter hippo, crocodile, lechwe antelope, and, if you are lucky, the shy sitatunga antelope. Surrounding the permanent swamp are large areas of annually flooded "grasslands" or floodplains. Locally known as "melapo," these floodplains are used seasonally by zebra, tsessebe, wildebeest and Cape buffalo along with red lechwe. Game drives in the area are very productive, often starting on the transfer to camp from the airstrip. General game species are abundant around Little Vumbura including impala, kudu, zebra, common waterbuck, chacma baboon, red lechwe, vervet monkey and common reedbuck. 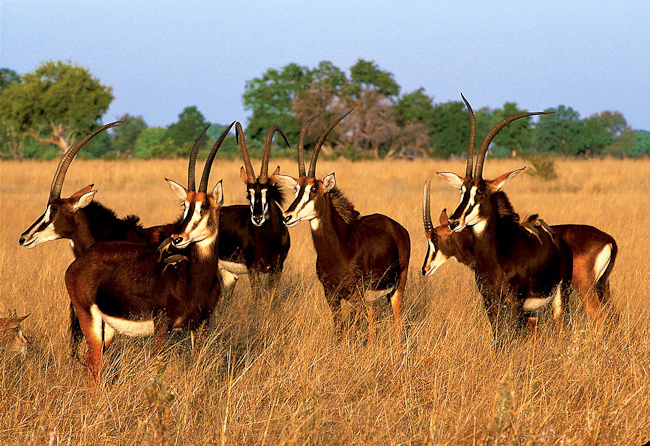 Sable antelope, giraffe, elephant, tsessebe, Cape buffalo and hippo are also often seen. Wild dogs frequently move through the concession and other predators include several resident lion prides, leopard, cheetah and the African wildcat. The birding here is excellent and varied throughout the year. In the summer months many migrant species are present. Pel's Fishing-Owl is regularly seen, with other specials including Wattled Crane, Slaty Egret, Chirping Cisticola, Little Bee-eater, Fan-tailed Widowbird and possibly Rosy-throated Longclaw. Vumbura Plains and Little Vumbura are part of the same community participation plan as Duba Plains. The aim is to bring the communities who live around the Okavango Delta into the tourism mainstream. The villagers who live to the north of the Okavango have been granted the rights to this area, which allow them to derive direct benefits from the wildlife through significant concession fees, employment opportunities and training. Vumbura is part of a community participation plan that brings the benefits of ecotourism to the communities that live around the Okavango Delta. Vumbura is situated in a Wildlife Management Area adjoining and north of the Moremi Game Reserve. It is a community area, and the five villages on the northern perimeter of the Delta combined to form a Trust to manage the affairs of the community and to ensure that any rewards are fairly distributed. The Trust, called the Okavango Community Trust (OCT), has developed a partnership with Wilderness Safaris, where Wilderness leases the land from the community, markets, sells and manages the camps in the area, and in return undertakes to employ, train and wherever possible, uplift the living standards and skills of the community people.